Within a day&apos;s drive of two-thirds of the population of the United States, Lexington is strategically located at the intersection of interstates 64 and 75 in Fayette County, Kentucky. (See map. ) 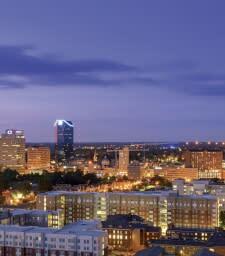 Lexington is accessible by air with approximately 100 direct and nonstop flights. Nestled among world famous Thoroughbred horse farms, Blue Grass Airport (LEX) welcomes travelers with one of the most beautiful air approaches in the nation. The city is set up like a wheel with spokes, with main arterial roads running from downtown out into horse country. Major car rental companies have desks at the airport and branches around town. Public bus service is provided by LexTran. Visitors also have access to taxi companies, Uber and Lyft. A great way to see horse country is with a van tour company. Click here for more about transportation options. When you are in the Horse Capital of the World, stop by our downtown Visitors Center, 215 West Main Street in Lexington&apos;s historic former County Courthouse. We are open Monday through Friday from 9:00 a.m. to 5 p.m., and Saturdays from 10 a.m. to 5 p.m. (Open Sunday from noon till 5 p.m. in the summer.) Speak with a Visitor Information Specialist, browse informative brochures and maps, learn about the Bluegrass Region on interactive screens, send a digital postcard, and sniff some Bourbon. When European settlers arrived on the scene, the Bluegrass region was in use as a hunting ground by numerous Native American tribes. Daniel Boone was one of the first Anglo-Saxons to explore the area. He helped establish Kentucky&apos;s first forts in Harrodsburg and Boonesborough. Lexington was founded in 1775, seventeen years before Kentucky became a state. William McConnell and a group of frontier explorers were camped at a natural spring when word came from nearby Fort Boonesborough that the first battle of the American Revolution had been fought in Lexington, Massachusetts. 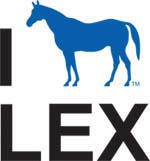 In honor of the battle, the group named their site "Lexington". By 1820, Lexington, Kentucky, was one of the largest and wealthiest towns west of the Allegheny Mountains. So cultured was its lifestyle, our city soon gained the nickname "Athens of the West." Fayette County consists of 283 square miles of gently rolling plateau in the center of the inner Bluegrass Region. The area is noted for its beauty, fertile soil, excellent pastureland and horse and stock farms. Poa Pratensis (bluegrass) thrives on the limestone beneath the soil&apos;s surface, playing a major role in the area&apos;s scenic beauty and in the development of champion horses. Numerous small creeks rise and flow into the Kentucky River. The U.S. Census estimate for Lexington-Fayette County is 321,951 (2018). The estimated population of the metropolitan statistical area (MSA), which is comprised of Bourbon, Clark, Fayette, Jessamine, Madison, Scott, and Woodford counties, is 512,650 (2017). There are over 230 churches and synagogues in Lexington, representing 38 denominations as well as mosques and a Hindu temple. Call the Lexington Visitors Center if you are having trouble locating a specific house of worship. Minimum drinking age is 21. Alcoholic beverages may be sold in licensed bars and restaurants from 6 a.m. to 2:30 a.m. Monday through Saturday and from 11 a.m. Sunday to 2:30 a.m. Monday. Package stores may open from 7 a.m. to 2:30 a.m. Monday through Saturday and 1 p.m. to 9 p.m. on Sunday. Smoking is not allowed inside public buildings, including restaurants. The mean average temperature in Lexington is 54.9 degrees Fahrenheit. Annual precipitation is 45.68 inches. Lexington and the Bluegrass Region have four distinct seasons that include cool plateau breezes, moderate nights in the summer, and no prolonged periods of heat, cold, rain, wind, or snow. Lexington&apos;s crime consistently ranks below the national average. In addition to foot and car patrols, the Lexington-Fayette Urban County Police Department operates two highly visible units that have proven to be effective crime deterrents. The Lexington Mounted Police Unit and Mountain Bike Unit patrol the downtown area on horseback and bicycles to help assure community safety. The Lexington Herald-Leader is our daily morning newspaper. The Council of State Governments, the National Tour Association and the Association of Retail Travel Agents are national organizations that are headquartered in Lexington. Also, The National Horse Center at the Kentucky Horse Park is the national headquarters for more than 30 equine associations. Kentucky state sales tax is 6%. Groceries are exempt. There is a hotel tax of 8.5% and a state fee of 1%, bringing the total tax on hotel rooms to 16.07%.